Crown jewel of the Klima Hotel Milano Fiere is the new multifunctional scenic terrace, located on the 14°th floor, it receives light from the two huge glass walls that on one side overlook the area that hosted the expo, where Palazzo Italia and the Tree of life can be seen prominently. On the other side it overlooks the city centre. The terrace is an exclusive environment which can be used for different occasions such as: meetings, buffets,private breakfasts or dinners. 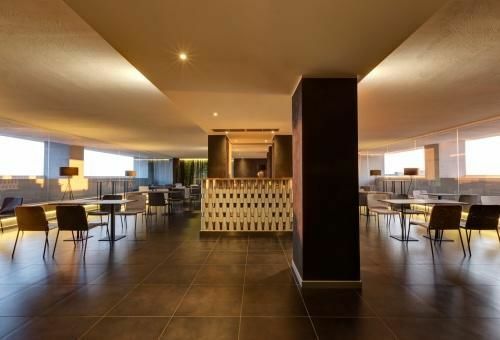 At the centre of the room, which can be completely obscured and is equipped with 80 seats, there is a counter made completely out of recycled paper and cardboard, in accordance with the hotel`s green philosophy. The outside balcony can be accessed through the two glass doors, which has a smokers area and on the same floor there is also a private bathroom.